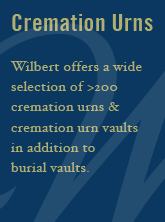 Keating Wilbert Vault Co. Inc. has been a premium vault provider for over 50 years. In recent years, Keating Wilbert has been run by the Dumala family dating back to 1975 where Daniel Dumala bought the company. Twenty years later the company was passed on to one of his sons David Dumala who still owns Keating Wilbert to this day. Keating Wilbert has been a family company since then and still employs family members including David's son Daniel, who is soon to be the new owner. Throughout these years, Keating Wilbert has always put the customer first, providing excellent products and service to families who have lost someone. At Keating Wilbert Vault we take pride in our work and serve families as if they were our own.